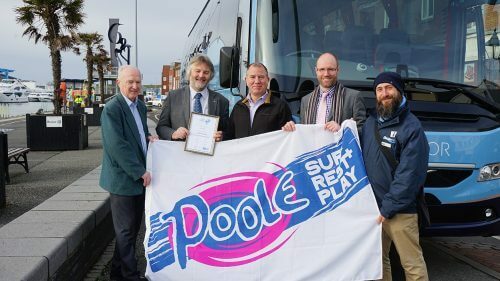 Poole was recently awarded ‘Coach Friendly’ status by the Confederation of Passenger Transport UK (CPT), which recognises the town’s commitment to ensuring visitors have access to top quality facilities, information and products. Poole is home to the largest natural harbour in Europe, with eight islands and peninsulas and 110m of inland harbour and beaches with convenient coach drop off points situated at Poole Quay. John Burch, SW Regional Manager for the CPT, said: “CPT is delighted to add Poole to those locations that have achieved Coach Friendly status. “The Coach Friendly scheme looks at signage, parking, set down/pick up locations, customer facilities and customer and operator incentive schemes amongst other things. “The Tourism Partnership has used its initiative to overcome several issues and has been judged to have achieved the appropriate standard.